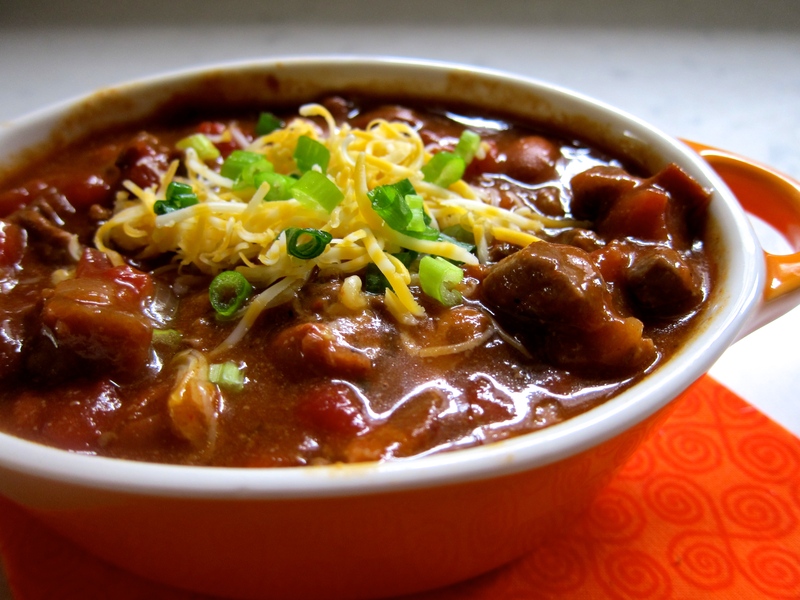 Hi there– I wish I could say we were avid football fans– and we had this super chili recipe to serve up to all our football fanatic friends while we cheered on our team in front of the t.v. But actually, we go to one one Cal Berkeley game every fall to hang with our kids– and if some kind hearted friends include us in their super bowl party, we’re all in! In a soup pot, cook the bacon until it is crisp and then remove it from the pan. In the bacon dripping, cook the chopped onions and take them out as well. Drop the beef into the pot and cook it 5 or 6 minutes until is is all browned. Spoon off any extra fat that is in the pan. Add in the garlic, cumin, paprika and chili powder and stir to coat the meat. Then mix in the beer, tomatoes, chili beans, and cilantro and set the pot to simmering slowly for about 30 minutes. In a container with a tight fitting lid, shake together the corn starch and 1/2 cup water. Stir it into the chili to thicken the broth. Drop the bacon and onions back into the pot! Serve it piping hot topped with cheddar or sour cream or green onions or cilantro (or any combination there of)– along with a slab of cornbread and a bright salad. Football watching ready! This entry was posted in Food and tagged bacon, beans, beer, chili. Bookmark the permalink. Wow this sounds incredible! I am actually just finishing up my first chili recipe (I used beer as well) How did I not think of BACON!? that’s GENIUS! Great idea to add bacon. I will have to give it a try. I use plain coconut yogurt as a dairy free alternative to garnish mine. Hi Chloe– I’ve never heard of coconut yogurt! Maybe it has made it this far west. — and I’m with you on the merits of pop corn in your last post!! a favorite. Hi, coconut yogurt is lovely. I have CoYo. The website is Coyo.com, it’s available in the US. Mmmmm…. love that chili. Beer and bacon are great additions. Hi Suzanne– they are yummy, not so healthy– but for a sometimes comfort food, just about right! Happy weekend!! Are you cooking a turkey next week? Good cold weather food– how is it there now for you all? cold but Sunny, Max. 10 °C in the day & at night Max. 2°C! Cold winds too! Oh golly!! Stay warm inside Sophie! So simple and delicious….I really love the picture!! Thanks Serena– that’s encouraging since you have the most beautiful food photos ever! Rhonda… I made this for dinner tonight. It was a huge hit! Yum!! So glad to hear it Jaci!! We had a wonderful time with A & J this weekend– She is getting to be such an impressive cook!